I've never been the person to ask if you don't want an honest answer or review. I'm a Virgo; so, I'm super grounded and brutally honest...to everyone, myself included. If I don't like something, I'll say it. In this case, I offered to do a review of the product and was sent a sample to try: no paid advertisement or endorsement; ok, now on with the review! Recently I had the good fortune to connect via Instagram with Diana from Liao's Food creators of Chili Chutney. She grew up in the town over from me, and I'm pretty sure I've been to her parents' restaurant as a teenager. 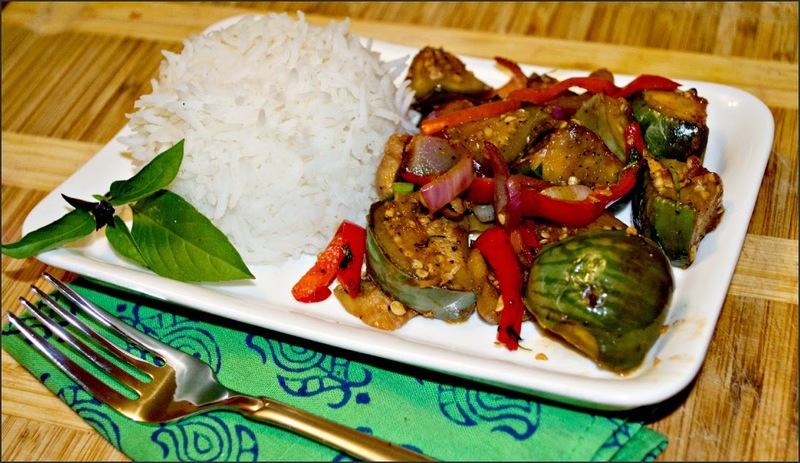 Chili Chutney... its name explains exactly what it is perfectly, an Asian fusion hot sauce. To understand and truly appreciate this hot sauce you have to know a little something about its creator. Mr. Liao, Diana's Dad, is of Chinese heritage who was born and raised in Kolkata, India, before moving to the US and eventually, after many years of hard work, opened his own restaurant in Central NJ. 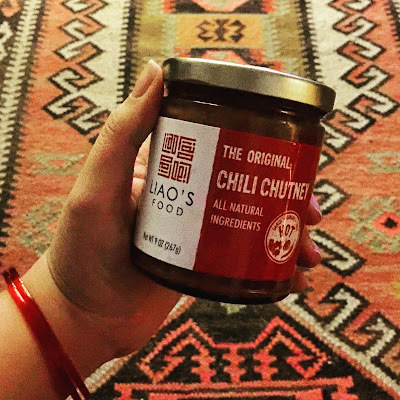 This fusion of Chinese and South Indian food cultures is reflected brilliantly in the name and taste of Liao's Chili Chutney. It is the perfect balance of sweet chili heat with plenty of garlic- ginger and a ketchup-like consistency. 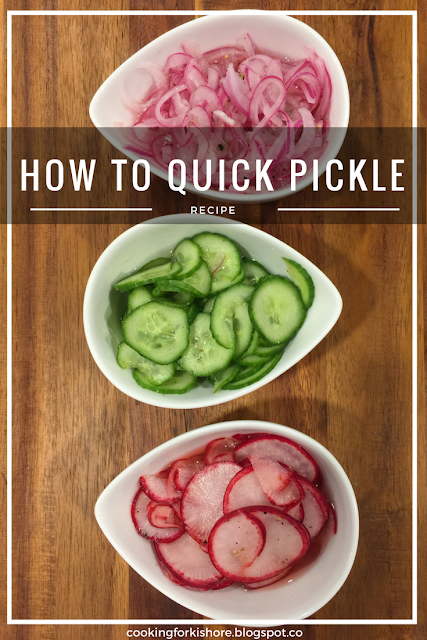 It's this balance that makes it a versatile sauce, good for a variety of uses, and cuisines. 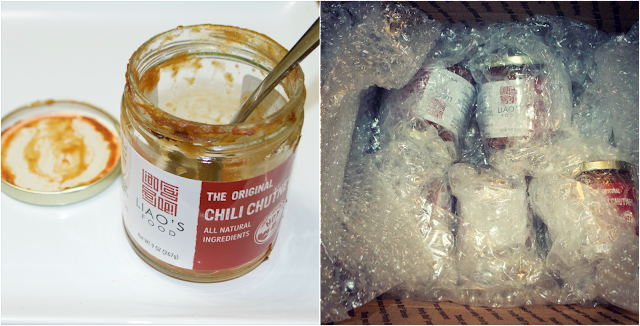 If you like your food with a bit of a heat, spice, and an extra layer of flavor, I would highly recommend trying Liao's Chili Chutney. 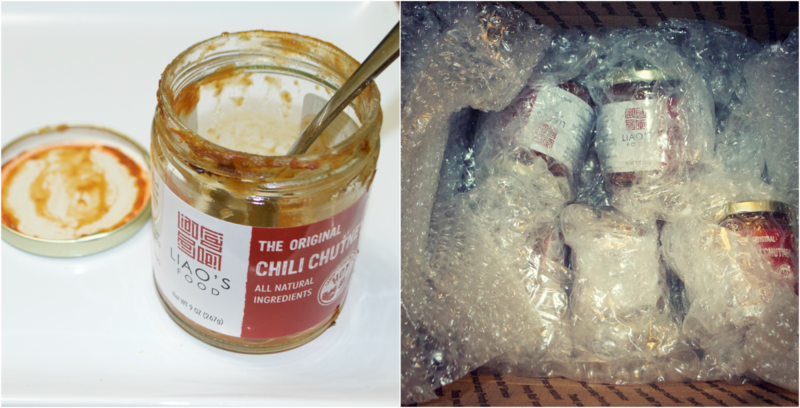 Chili Chutney is available for purchase online and at select specialty markets. Visit their site for details. If you are in the NY-NJ area, be sure to stop by and visit them at the Cranford Artisan Winter Market on Feb. 27, Mar. 12 & 19. As soon as we got the sample bottle, we opened it to give it a try, I stepped out of the room to get a spoon, and Kishore had already poured it on a Knish he was eating for lunch! This being a blog about our multicultural kitchen Chili Chutney found a place in a lot of our recipes. We actually finished the sample jar pretty quickly and ordered more to share with friends and family. I had a lot of fun using it in my "tried and true" recipes, but I also created a few recipes which I'll be publishing over the next few days so keep a look out!